I do enjoy some New Adult books, they have all the emotion and drama I love and this book was one of those. Its a solid story too of childhood friends and the trappings of fame. Noah and Chloe have been friends and neighbours since they were very young. Their families are almost as one. I love the way Chloe’s mum is known as The Commander 🙂 not because she’s overbearing or bullying, but because when she asks everyone does what she says. Anyway we start with Noah entering a reality TV music show, and Chloe as always is a staunch supporter back in their home town. She’s in love with him, but won’t admit it even to herself. Past events almost brought them together but for various reasons Chloe kept them as friends, and she’s convinced that’s how Noah sees her. Every girl she sees him with takes away another piece of her heart. Once he becomes a celebrity she also gets a new job in photography for a teen magazine, as the editors are convinced ( correctly ) she has an “in” to the latest media sensation, which of course will be great for them. She’s on tour with Noah and his entourage, fighting jealousy from seeing him with his girlfriends, working to hide her feelings, and becoming something of a media sensation herself. Then danger threatens and everything changes. Its a beautiful love story, two wonderful people just right for each other but struggling not to lose or risk their friendship. Each is blind to the others feelings, even though everyone else can see it…Once the celebrity drama hots up can they come closer or will it push them further away. 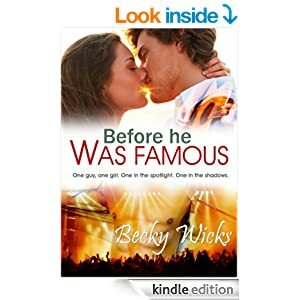 Its interesting to see fame from the other side, to see what an effect it has on people’s lives, and this novel felt very realistic. I love all the emotion and jealousies, love the drama, the dangers, and the wondering will they work it out. I love the way social media was portrayed, sometimes I think the public are obsessed with celebrities, and some people believe anything in print or online has to be true, when in fact its almost always carefully manipulated ( gosh, aren’t I a cynic! But it’s true) There are some great characters from the cockney talking manager ,( my nan was born in Battersea so my grandparents often used some of those terms – dog =dog and bone = phone, apples= apples and pears= stairs, it’s a language all of its own) the weird and wonderful Courtney and her cat, the backing musicians, and the families. Each played a special part in bringing events together to make a fun and emotional read. Stars: Four and a half, just shy of five.